Protein rich soya chunks to make delicious and healthy vegetarian Indian cuisines. 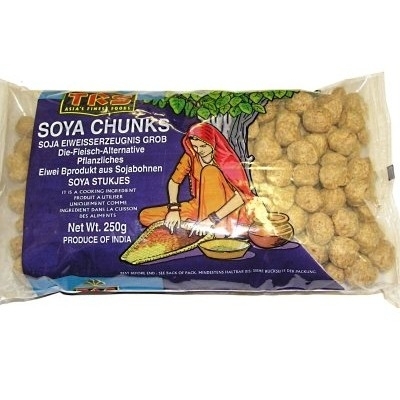 Soya chunks are ideal for those who are vegetarian and crave for protein. You can cook healthy and delicious recipes using soya nuggets. An ideal, protein-rich meat alternative. Firm and chewy when cooked. Un-flavoured, therefore soak up all the flavours of the dish. Soya protein is very popular around the world, and is a staple for some people. It contains all eight basic amino acids, and is thus a balanced source of protein. It can be used instead of meat. The soya protein in these chunks is also fortified with the essential vitamins thiamine, riboflavin and vitamin B12, as well as iron.